Debt, Debt And More Debt: Is Democracy To Blame? The federal debt is at record levels and growing. States are "grappling with unprecedented fiscal crises," a new report says. And Europe's debt mess threatens the world economy. 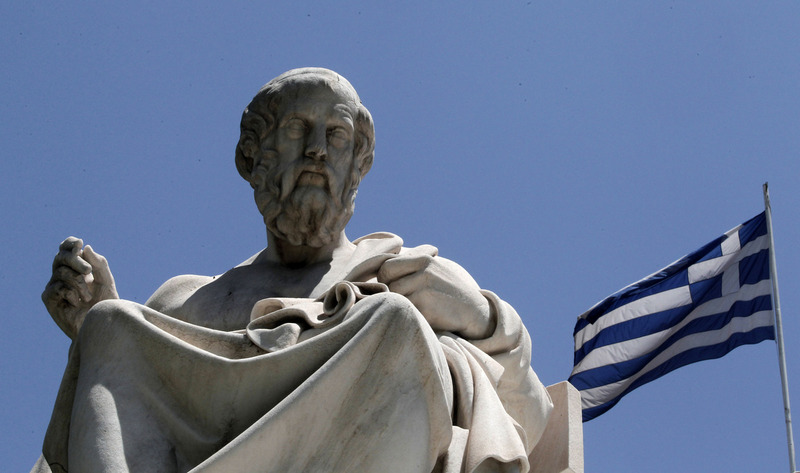 Some scholars think, like Plato, that democracy is the problem. Debt, Debt And More Debt: Is Democracy To Blame? The marble statue of Plato stands in front of the Athens Academy in Athens. The ancient Greek philosopher had his doubts about democracy. High-profile experts are staging two separate Washington press conferences Tuesday to demand action on public-debt problems. One group is targeting state budget crises; the other, the federal budget mess. If the ancient Greek philosopher Plato were still alive, he might hold a third press conference to declare: "It's hopeless. I told you so. Democracy will always degenerate into chaos because people will vote for their immediate self interests, not the long-term good." At a time when nearly every major democracy in the world is facing a debt crisis, some people are wondering: Might Plato be right? And if voters keep electing leaders who can't balance budgets, what happens next? (SPOILER ALERT: If you believe Plato, you won't like where this story is heading). The seriousness of the public-debt crisis was underscored Tuesday when the nonpartisan State Budget Crisis Task Force released a report assessing the fiscal health of states in the wake of the Great Recession. "States are grappling with unprecedented fiscal crises," the experts found. The task force, led by former Federal Reserve Chairman Paul Volcker and former New York Lt. Gov. Richard Ravitch, concluded that many budgets are so out of whack that states are facing "major threats to their ability to provide basic services to the public, invest for the future and care for the needy." Also Tuesday, Erskine Bowles, who co-chaired the bipartisan presidential deficit commission in 2010, announced that a group of budget experts are launching a campaign to spur Congress to immediately address the "fiscal cliff." That term refers to a huge cluster of tax and spending changes set to take effect at year's end. Economists say that if Congress does nothing, the changes now set on autopilot are so drastic they will jolt the U.S. economy and shove it over a "cliff" into recession. Bowles is a director of the nonpartisan Committee for a Responsible Federal Budget, which is now kicking off its "Campaign to Fix the Debt." The committee's latest report concludes that if lawmakers fail to act, "it could lead to a loss of confidence in their ability to govern that could set off a dangerous chain reaction in markets." Meanwhile, a debt crisis is dragging Europe — and maybe the whole global economy — into recession. Debt is not just a Western problem. For example, in Japan the debt load is more than double the size of the country's entire gross domestic product. What's going on? Can't self-governing people govern? Plato may have gotten there first, but many people have followed up, asking just that question. Back in 1978, Auburn University professor Robert Ekelund co-authored a paper entitled "Deficits and Democracy." His historical research, done along with W. Mark Crain, also a professor, found that all over the world, no matter what the culture or continent, "democratic governments have exhibited tendencies to run perennial budgetary deficits." That's because the people who win elections often are those who promise what voters would like: lower taxes or more public services, such as better roads and more police. Once in office, a lawmaker discovers that "in financing the desired output of the public sector, the politician [must choose between] raising taxes versus borrowing funds," the professors wrote. The easier choice is to borrow and pass the cost to a future generation that does not yet vote, the paper said. The researchers concluded voters must impose restrictions upon elected officials in the form of balanced-budget amendments or "pay-as-you-go" legislative rules, which require tax hikes or spending cuts whenever new programs are added. Ekelund, now in his 70s, is retired. The budget deficits he worried about decades ago are much worse today. In an interview, he said voters should have heeded his warnings and pushed for constitutional or legislative restraints on running deficits. "When you bring public choice into the matter, there is a built-in bias to create deficits," he said. But another professor has reached a different conclusion after studying historical outcomes. University of Virginia law professor Richard Schragger examined the massive budget deficits of cities and states in the 19th century. He found that fiscal mismanagement was far worse then. For example, in 1841-42, nine states defaulted on their debts, as did hundreds of cities during the 1800s. "Public services were reduced and infrastructure projects had to be scuttled, state and municipal property had to be sold off, and in some cases bondholders never got paid," Schragger wrote in a Yale Law Journal essay, "Democracy and Debt." And the 20th century had some spectacular fiscal messes, too. In the mid-1970s, New York City needed billions of dollars in federal loans to work itself out of a hole. Schragger says those examples show that when facing calamity, voters are willing to elect reformers and soldier on through booms and busts. That messy process serves the public better than the strict imposition of tight restraints to stop all deficits, he said. For example, in hard times, voters might want to elect leaders who will create road-building jobs to help boost spending. "Constitutional constraints are, by definition, limits on the regular representative political process," Schragger said. In an interview, Schragger said that while voters have proved they can solve problems, tyrants are far from a safe fiscal bet. Indeed, American colonists overthrew their British king because they felt his tax policies were not sound. "It would surprise me if autocratic regimes are more fiscally responsible" over time, compared with elected leaders who must answer to voters, Schragger said. How About Letting Voters Decide How To Spend? Some pro-democracy groups say that the solution to budget problems is to have even more democracy. They support a citizen-engagement movement known as "participatory budgeting." The practice began in Brazil in 1989 and has spread to many communities around the world. Supporters say state and federal government should provide grants to allow direct voting on what local communities might want. For example, in Chicago's 49th Ward, residents recently were allowed to vote directly on how to spend $1.3 million, rather than wait for city or state officials to make all decisions. Voters chose sidewalk repairs and streetlights. That kind of direct democracy and participatory budgeting could help voters better understand — and solve — budgeting problems, supporters say. But Plato? He concluded that democracy invariably must crumble because citizens are fundamentally indifferent to the greater good. In time, tyrants take over. In the United States, that has not been the outcome so far. Having learned from King George in 1776, "they know a king could spend you into ruin too," Schragger said.